As I’m sure is the case for a lot of our readers, we all come across various written quotes and affirmations, particularly in social media nowadays, and many of these largely pass us by, but then every so often there’s one that just captures us. In my own experience it can sometimes be even more than that, I feel completely moved, life changed by the shift in thinking that the quote creates for me. Sometimes I can relate to why, other times I don’t have this awareness, or at least not on a conscious level. Who it belongs to is largely irrelevant for me other than the more the merrier on this type of thinking, especially in times of need. What matters for me personally is how it made me feel on reading this, the reminder of hope. Hope is powerful, it can help to crush pain, disappointment and sadness into dust carried off on a breeze. Just when we think it’s gone hope rears its head, sometimes from what seems like nowhere – a thought, a person, the right words at the right time, a professional who offers kindness, compassion, support and understanding. Though media can often focus on the negative things that happen in the world e.g. people’s wrong-doings, there’s lots of helpers in society, some may be professionals some other helpers. Perhaps the only difference is our expectations placed upon the different types of helpers. With professionals we expect them to help. Maybe in your GP practice it doesn’t need to say Dr. Smith or Dr.Selim on the door, because we just interpret ‘Helper’. So these professional ‘Helpers’, who helps them when they become ill? 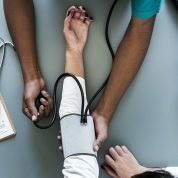 There is a need for approaches that are sensitive to the contextual complexities of mental ill-health in doctors, and that do not treat doctors as a uniform body, but allow distinctions to account for particular characteristics, such as specialty, career stage and different working environments. But as we’ve seen in various media articles recently, GPs in some cases are reaching crisis, and not getting the help they require. There are a whole host of reasons behind this. Some systemic issues, some stigma and self-stigma – after all no one is immune to the pervasiveness of stigma – and various other explanations. Mind surveyed 1066 GPs in England and Wales (of whom 100 were working in Wales) from January-March 2018. Respondents were a self-selecting sample who completed the survey online. Samantha K Brooks, Clare Gerada, & Trudie Chalder (2011) Review of literature on the mental health of doctors: Are specialist services needed? Journal of Mental Health Apr;20(2):146-56. doi: 10.3109/09638237.2010.541300. Epub 2011 Jan 28.